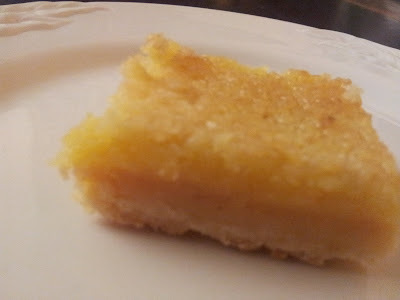 We had lemon slice for dessert tonight. It was very "lemony" and intense, and rather difficult to stop at just one piece. The recipe is from David Lebovitz's, original link here. 1. Preheat the oven to 180ºC. Grease and line a (very) large baking tray with paper. 2. Add all the ingredients for the crust into the TM bowl. Mix for a few seconds on speed 6 -7. Set on "Knead" for 2 -3 minutes. Transfer dough to the baking tray. Spread out the dough using the back of a large metal spoon. 3. Bake the crust for 25 minutes, or until deep-golden brown. 4. While the crust is cooking, cut the lemons in half, remove the seeds, then cut into quarters. 5. Whizz the sugar in the TM for 20 sec, speed 9. Transfer sugar to another bowl. Add the lemons, to the TM bowl, blend for 8 - 10 sec, speed 8. Return the sugar to the lemons in the TM bowl, add eggs, corn flour, salt, and melted butter, and blend until almost smooth - about 30 sec, speed 7 (a few tiny bits of lemon pieces are normal and encouraged). 6. When the crust comes out of the oven, reduce the heat of the oven to 150ºC. Pour the lemon filling over the hot crust and bake for 20 to 25 minutes or just until the filling stops jiggling and is barely set. 7. Remove from the oven and let cool completely. Cut the bars into squares or rectangles. Sift powdered sugar over the top just before serving, if desired.